JAPANESE ANEMONE, HONORINE JOBERT (Anemone hybrida Honorine Jobert). A gem of a plant for a semi-shady position. Slow in its first year, then when established rapidly forms a large colony. Very free flowering with flowers held well above the foliage on erect 3-4ft (90-120cm) stems which do not need staking. Three month flowering period from August to October. Single white flowers with 6-9 petals and outstanding golden centres. Cut stems down to the ground after flowering. JAPANESE ANEMONE, PROFUSION (Anemone hybrida Profusion). A gem of a plant for a semi-shady position. Slow in its first year, then when established rapidly forms a large colony. Very free flowering with flowers held well above the foliage on erect 3-4ft (90-120cm) stems which do not need staking. Three month flowering period from August to October. Outstanding purple-pink, semi-double flowers. Cut stems down to the ground after flowering. JAPANESE ANEMONE, QUEEN CHARLOTTE (Anemone hybrida Queen Charlotte). A gem of a plant for a semi-shady position. Slow in its first year, then when established rapidly forms a large colony. Very free flowering with flowers held well above the foliage on erect 3-4ft (90-120cm) stems which do not need staking. Three month flowering period from August to October. The best semi-double, with large clear pink flowers. Cut stems down to the ground after flowering. JAPANESE ANEMONE, SEPTEMBER CHARM (Anemone hybrida September Charm). A gem of a plant for a semi-shady position. Slow in its first year, then when established rapidly forms a large colony. Flowers are held well above the foliage on erect 3-4ft (90-120cm) stems which do not need staking. Three month flowering period from August to October. Very free flowering and clump forming variety with single clear pink flowers. Cut stems down to the ground after flowering. JUNIPER BLUE CARPET (J. squamata Blue Carpet). Excellent vigorous carpeting evergreen conifer with dense, aromatic, eye-catching silvery-blue needle-like foliage. Tolerant of moderate shade. Height 12ins (30cm). Plant 2ft (60cm) apart. JUNIPER GOLDEN CARPET (J. horizontalis Golden Carpet). Excellent vigorous evergreen carpeting conifer with dense, aromatic, needle-like foliage. Excellent, new, very prostrate cultivar with bright yellow new foliage which changes to old gold in summer. Height 12ins (30cm). Plant 2ft (60cm) apart. JUNIPER GREEN CARPET (J. communis Green Carpet). Excellent vigorous evergreen carpeting conifer with dense, aromatic, needle-like bright green foliage. Sets green berries, which turn to glaucous blue and finally to black in the third year. Height 6ins (15cm). Plant 2ft (60cm) apart. An excellent easily grown, drought resistant plant with downy, rounded light green leaves. Sprays of tiny green-yellow flowers dance gracefully over the leaves from June to August. Cut back flower stems after flowering. Dies down in winter but will shoot again in spring. Height 12ins (30cm). Plant 2ft (60cm) apart. LAUREL, MOUNT VERNON (Prunus laurocerasus Mount Vernon). Superb evergreen ground cover plant with glossy leaves, dark green above and pale green beneath, on horizontal branches. In mid to late spring it produces masses of spikes, up to 5 inches (13cm) long, of scented white flowers. These are followed by cherry-like fruits. Excellent in shade and tolerant of drip from overhead trees. Very hardy. Height 1ft (30cm), spread 2ft (60cm). Plant 18ins (45cm) apart. Lively, dense, spreading evergreen shrub, with angular branches clothed with masses of small bright mid-green, glossy leaves which are held in all but the severest winters. Funnel-shaped cream-white flowers in late spring are followed by clusters of translucent violet berries in autumn which provide excellent bird food. Good ground cover plant, tolerant of dense shade. Height 2ft (60cm). Plant 2-2.5ft (60-75cm) apart. AVAILABILITY: Click on Check Availability to check stock. Items marked Br (Bare rooted) can normally be sent between November and March. Evergreen with glossy green leaves and 1-2 inch (2.5-5cm) spikes of tiny petal-less flowers with prominent white stamens, sometimes tinged purple, in early summer. Creeping, dense mat forming habit. Tolerant of dense shade and will spread rapidly in moist humus-rich soil. Height 6ins (15cm). Plant 12-15ins (30-38cm) apart. Very vigorous evergreen carpeter with large glossy leaves, and tolerant of dense shade. 1 inch (2.5cm) wide pale purple-blue flowers appear April and June and sometimes again in autumn. The mid to dark green foliage is a good back-cloth to the pale purple-blue flowers. Excellent for binding soil. Height 9-12ins (23-30cm). Plant 18-24ins (45-60cm) apart. PERIWINKLE, LESSER - AZURE BLUE (Vinca minor Bowles' Blue) (V. m. La Grave). Vigorous evergreen carpeter with deep green glossy leaves and tolerant of dense shade. Outstanding lavender-blue flowers 1.25ins (3cm) across appear March to July, then intermittently until October. Slower to form a dense clump than Greater Periwinkle, so more suitable for restricted places. Excellent for binding soil. Plant 15-18ins (38-45cm) apart. PERIWINKLE, LESSER - GERTRUDE JEKYLL (Vinca minor alba Gertrude Jekyll). Vigorous evergreen carpeter with compact neat habit, glossy deep green foliage and tolerant of dense shade. A profusion of small white starry flowers appear March to July, then intermittently until October. Slower to form a dense clump than Greater Periwinkle, so more suitable for restricted places. Excellent for binding soil. Height 4ins (10cm). Plant 15-18ins (38-45cm) apart. PERIWINKLE, LESSER - ILLUMINATION (Vinca minor Illumination). Evergreen carpeter with stunning bright golden leaves with narrow dark green margins on pink-tinted stems. Holds its colour well even in the shade, so excellent to brighten up shady areas. Pale lavender-blue flowers April and June and sometimes again in autumn. Height 6ins (15cm). Plant 15-18ins (38-45cm) apart. PERIWINKLE, LESSER - MULTIPLEX (Lesser Double Burgundy) (Vinca minor Multiplex). Vigorous evergreen carpeter with glossy deep green foliage and tolerant of dense shade. Outstanding double, deep rich plum-purple flowers appear March to July, then intermittently until October. 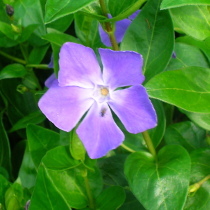 Slower to form a dense clump than Greater Periwinkle, so more suitable for restricted places. Excellent for binding soil. Height 4ins (10cm). Plant 15-18ins (38-45cm) apart. PERIWINKLE, VARIEGATED GREATER (Vinca major Variegata). Very vigorous evergreen carpeter with large glossy leaves, and tolerant of dense shade. 1 inch (2.5cm) wide pale purple-blue flowers appear April and June and sometimes again in autumn. Excellent for binding soil. Very attractive gold and green variegated leaves. Height 9-12ins (23-30cm). Plant 18-24ins (45-60cm) apart. POTENTILLA GOLD CARPET (P. fruticosa Goldteppich). A very hardy, dense, low spreading bush with bluish-green leaves and very large golden-yellow flowers from May to September. Best grown in full sun for most profuse flowering, but tolerant of partial shade. Height 9-12ins (23-30cm). Plant 2ft (60cm) apart. An excellent low growing evergreen with masses of orange flowers throughout summer. Plant in well drained soil in a sunny position. Cut back after flowering. Wonderful for ground cover or for trailing over walls. Height 6-9ins (15-23cm). Plant 2ft (60cm) apart. An excellent low growing evergreen with masses of pink flowers throughout summer. Plant in well drained soil in a sunny position. Cut back after flowering. Wonderful for ground cover or for trailing over walls. Height 6-9ins (15-23cm). Plant 2ft (60cm) apart. An excellent low growing evergreen with masses of red flowers throughout summer. Plant in well drained soil in a sunny position. Cut back after flowering. Wonderful for ground cover or for trailing over walls. Height 6-9ins (15-23cm). Plant 2ft (60cm) apart. An excellent low growing evergreen with masses of yellow flowers throughout summer. Plant in well drained soil in a sunny position. Cut back after flowering. Wonderful for ground cover or for trailing over walls. Height 6-9ins (15-23cm). Plant 2ft (60cm) apart. ROSE OF SHARON (Hypericum calycinum). Rapid carpeting evergreen or semi-evergreen sub-shrub with large golden-yellow flowers from June to September. Cut down to near ground in April to obtain thickest cover. Any well drained soil. Tolerant of dense shade. Spread by runners and can be invasive. Height 12ins (30cm). Plant 15-18ins (38-45cm) apart. Very prostrate evergreen with hairy stems and silvery-green woolly leaves which form a dense aromatic carpet. Pale pink flowers dot the carpet of leaves in mid-summer. Good fast spreading habit, full sun. Leaves, although small, can be used in cooking. Height 1-3ins (2.5-8cm), spread 3ft (90cm). Plant 2ft (60cm) apart.